Revolutionary claims are no surprise in science journalism, but this one seems unusually thin. The collar combines an accelerometer with a GPS receiver, but the main advance seems to lie in calibration efforts that the developers are doing with a captive mountain lion (“Mischief”) in Colorado to match movement patterns with certain activities — stalking and killing a rabbit, for instance — and to calculate the corresponding expenditure of energy. Nice if it works, but not exactly Copernican. But what really struck me in reading this article — and since I’m a historian who has written a lot about the early days of wildlife radiotelemetry, this probably comes as no surprise — is how similar these ambitions and claims, in all of their details (and I really do mean all), are to those of the people who invented wildlife radiotracking in the early 1960s. With the earliest radiocollars, it was difficult not to get information about the activities of the animal you were tracking, since the deformation of the antenna led to characteristic variations in signal strength. 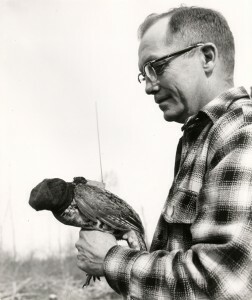 William Marshall, a biologist at the University of Minnesota, claimed in a 1965 article (“Ruffed Grouse Behavior,” BioScience 15, pp. 92-94) that he and his team could tell whether a grouse was feeding, flying, or sitting still just by listening to the warbling of the radio signal. And this mattered to Marshall exactly because it would allow the construction of energy budgets for individual birds, just as the researchers experimenting on Mischief are hoping to do. Around the same time, other researchers were busy designing satellite-based wildlife tracking systems and writing computer programs (on punch cards!) to predict animal movements on the basis of past behavior. You might say, so what? Why does it matter that, fifty years ago, a now mostly forgotten wildlife biologist was doing and dreaming the same thing as the researchers featured in the Times article, albeit with slightly less technical sophistication? Two thoughts: First, it matters because it gives us a more realistic view of how technoscientific progress usually works, i.e., slowly, incrementally, and collaboratively. Second, because it tells us something about the durability of dreams — in this case, the dream of a revolutionary technology that will make wildness and wilderness trackable, knowable, manageable, and savable in a world that’s a lot more complicated than that.